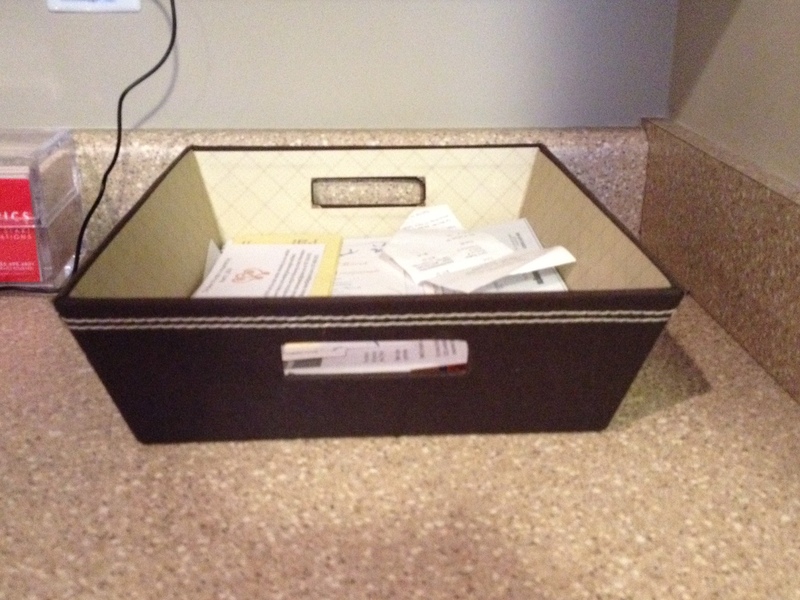 It’s a simple “inbox” on a counter in our kitchen. All items that need to be processed go into this box: mail, bills, receipts, communication from the boys’ schools, pay stubs, coupons, etc. David Allen, author of Getting Things Done: The Art of Stress-Free Productivity says that “collecting” is the first of five stages of mastering workflow, so this is our collection spot. With everything collected in one box, it is easy for me to process and organize the contents. Some items need a quick review and then can be moved to trash or recycling. Others require a response such as a signature or an RSVP. Items that need to be filed are taken upstairs to my office, where I immediately file them in the appropriate folder. (It would defeat the system to begin another pile on my desk!) Receipts get entered into the financial program on my computer before they are trashed or filed. Bills are paid and filed. Events and other to-do’s are put on the calendar. The result? Both the house and my brain are clutter-free. Do you have an effective organization system? 50 Worst Traffic Cities In The U.S.